On the eve of the World Cup semi-finals, Nike has shared some viewer and engagement figures of the brand’s performance on the pitch and online during the World Cup, claiming six billion impressions. 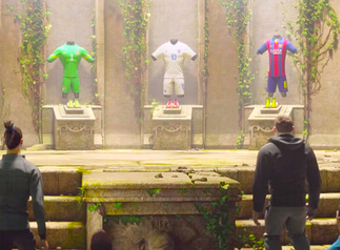 Don’t call it Nike’s World Cup campaign, of course, because it doesn’t have one. Adidas is the Official Sponsor, Supplier and Licensee of the 2014 FIFA World Cup, so let’s call Nike’s efforts its ‘football-themed activations that happen to coincide with a large, four-yearly football tournament’. Even without mentioning the ‘WC’, Nike has achieved staggering reach and engagement with its campaigns over the past three weeks. With the quarter-finals out of the way, there are two teams that play in Nike kits in the semi-finals: Brazil and Netherlands. Nike says this gives it a 52% ‘share of pitch’ based on minutes played in pitch, and notes that this compares to 38% for Adidas. For goals scored, Nike claims 72 (45%), while Adidas has 68 (43%), and other kit makers (Puma, Burrda, Marathon, Lotto) have 14 between them. 2014 has been heralded as the ‘mobile World Cup’, and if you include all views and impressions of the ‘Risk Everything’ campaign content, Nike says it’s chalked up over six billion impressions. More than two billion of these have been via mobile devices. ‘The Last Game’ film (below) has attracted more than 62 million views on YouTube – and Nike reports this is more like 205 million views across all different platforms. The ‘Ask Zlatan’ series, in which fans are invited to ask questions of the animated version of Swedish great Zlatan Ibrahimović, who gives third-person, megalomaniacal answers. Sweden is not at the World Cup, so neither is Zlatan, but he’s on the brand’s books. And Nike’s marketing is not about the World Cup at all, is it? Nike report the series has achieved 18.4 million views and 1.3 million engagements. For its part, Adidas, which is on a quest to be the most talked about brand at the World Cup, has reported “successful results” after the first 12 days of the tournament. At a media event in Herzogenaurach last week, Herbert Hainer, Adidas Group CEO, said: “We will definitely achieve our goal of €2 billion in sales in the football category in 2014. As Official Sponsor, Supplier and Licensee of the 2014 FIFA World Cup, Adidas supplies the Official Match Ball of the tournament and equipping officials, referees, volunteers and ball kids. Adidas says it will sell more than eight million jerseys, as well as 14 million footballs in the design of the Brazuca, the Official Match Ball of the 2014 FIFA World Cup. 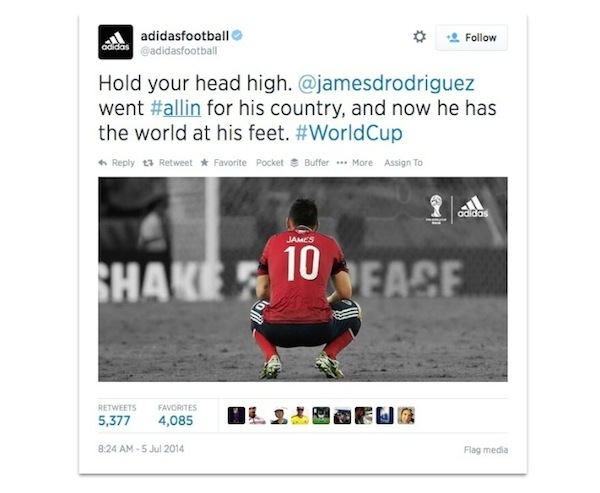 For the duration of the 2014 FIFA World Cup, the brand has set up a newsroom in Rio de Janeiro called ‘Posto Adidas’ from which it will create and share content via its social media channels in response to events. 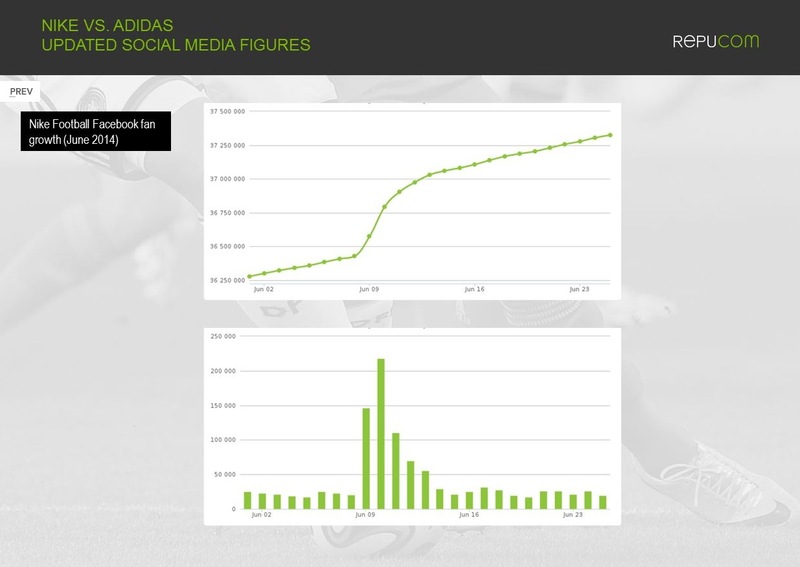 Reputation management consultancy Repucom has tracked the change in numbers of Facebook ‘likes’ since the beginning of June, noting that Adidas has seen a greater increase. Peter Dopkin, senior director of digital at Repucom say, “Now the FIFA World Cup has got underway we are really starting to see Adidas flex its ‘official status‘ muscle. 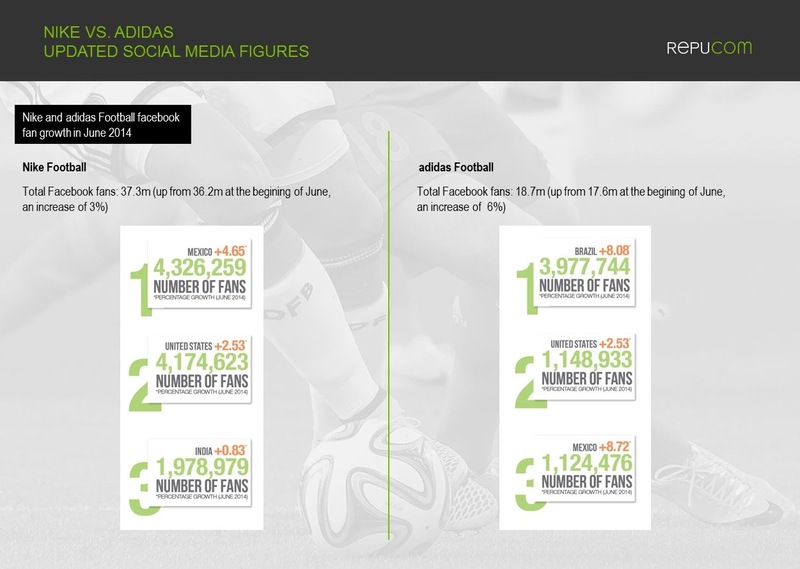 Both Nike and adidas have increased their fan base on Facebook by 1.1 million people so far in June. 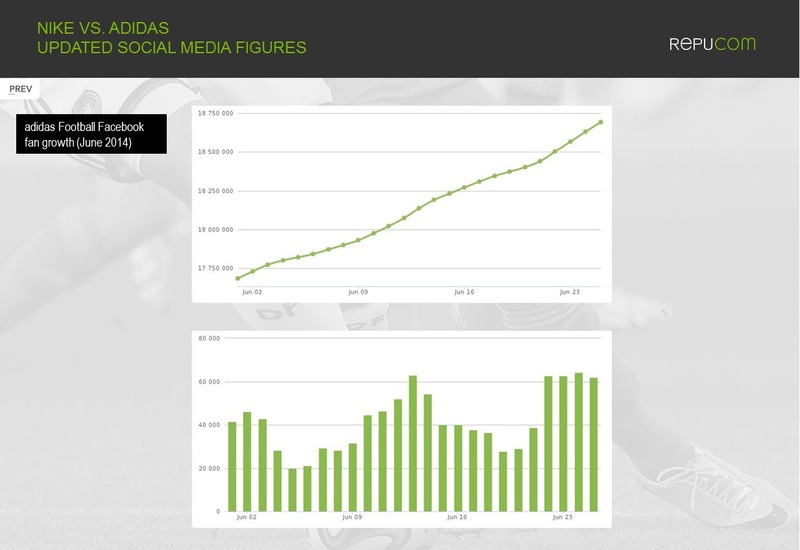 To Adidas who have fewer Facebook fans than Nike however, this increase represents a greater jump. Charts provided by Repucom. Click them to enlarge.